Now You Can Dust Like The Astronauts | OhGizmo! Well not exactly. 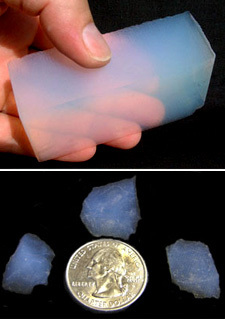 Aerogel is referred to as “the world’s lightest known solid” and while being chemically similar to glass, it’s actually composed of 99.8% air. Most recently it was used in NASA’s Stardust probe to assist in the collection of the dust trails left behind by a visiting comet. Now that’s the coolest thing I’ve seen in a while. But what will it be used for? If it wasn’t absorbent it might make really good flotation for marine use.